Are you interested in supporting the ASPCA through cause-related marketing? Learn more. If you would like to submit a proposal for a large-scale cause-marketing partnership on a national level, please email [email protected]. Subaru is proud to be a long-standing partner of the ASPCA to help bring pets and people together. Amazon will donate .5 percent of the purchase price of qualified items to the ASPCA when you shop at AmazonSmile! 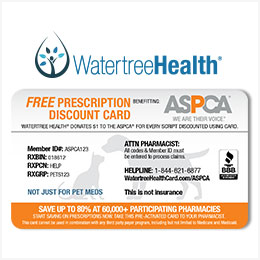 Watertree Health® will donate $1 every time you save money using the free Prescription Discount Card benefitting the ASPCA. Tito’s Handmade Vodka proudly supports the ASPCA for their dedicated work and commitment to keeping our furry friends in safe and loving homes. The Right Horse is proud to be a partner of the ASPCA to help find good people for good horses. A true kitty hero, BUB is using her fame to be a voice for cats and dogs, especially those who need some extra help. Official ASPCA personal checks and labels from Checks in the Mail support the ASPCA. Our Rescue Road Trip Playlist Is Here! You Can Bid Now to Support the ASPCA!